Cold frames for gardening and hotbeds, or sun boxes, are simple structures used for slightly different purposes but utilizing the same frame. Cold frames are fairly inexpensive to construct, although they can be made more elaborate and costly. Making a cold frame doesn’t need to be complicated and when you know more about using cold frames for gardening, they can serve a functional purpose year round. Cold frames are used for hardening or tempering tender starts prior to transplanting and allowing them to acclimate to exterior conditions. Useful for growing cool weather crops in the very early spring, fall and even winter, cold frames allow the home gardener to have access to fresh vegetables all year long. While hotbeds rely on an exterior heat source, such as soil heating cables or steam pipes, cold boxes (and sun boxes) rely solely on the sun as the heat source. To maximize solar absorption, the cold frame should be situated in an area facing south or southeast with good drainage. Also, placing the cold frame against a northerly wall or hedge will help protect against the frigid winter winds. Utilizing the earth’s insulating powers by sinking the cold frame into the ground will also aid in protecting the delicate crops. In times past, these sunken cold frames were often covered with a pane of glass but today they are more often constructed atop the ground and covered with plastic. Plastic coverings are less expensive and frames built above the ground can be formatted with lightweight materials that can be moved from spot to spot in the garden. 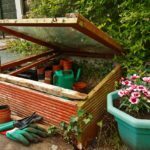 There are several types of cold frames available to the home gardener and learning how to build a cold frame will depend on your needs, space and budget. Some beds are constructed with wooden sidewalls and some are more permanent structures of masonry blocks or poured concrete. Wood supports should be treated with copper napthenate, but not creosote or pentachlorophenol, which can damage the growing plants. You may also choose decay resistant material such as cedar or pressure treated wood. Kits can be purchased and are easy to assemble and often come complete with ventilation equipment. Another possibility is the Dutch light, which is a large but portable greenhouse-like structure that is moved around the garden. The dimensions of your cold frame vary and depend on the space available and permanency of the structure. Four to five feet across is a good width to facilitate ease of weeding and harvesting. The sash of the frame should slope southward to maximize solar exposure. Insulation and ventilation are critical in the usage of a cold frame. When a sudden cold snap occurs, a simple way to insulate the cold frame is to place a burlap sack filled with leaves over the sash at night to prevent frost damage. If night temperatures drop too low, extra insulation can also be achieved with a layer of tarpaulin or a blanket tossed over the cold frames covering. Ventilation is most important during late winter, early spring or fall and on clear sunny days where temperatures rise over 45 degrees F. Raise the sash of the cold frame slightly to reduce the temperature inside the frame, taking care to lower again early enough in the day to retain some heat overnight. As seedlings get larger, gradually leave open or uncovered for the entirety of the day to harden the plants, readying them for transplantation. The cold frame can not only be used to harden plants prior to transplantation, but is also a terrific way to store some types of hardy vegetables over winter much like an old fashioned root cellar. To create a winter vegetable holding bin, hollow out 12-18 inches of soil from the frame. Place such veggies as beets, carrots, rutabagas, turnips and the like into the frame on a layer of straw and cover with the sash and a tarp. This should keep your produce crisp, but unfrozen, for the remainder of the winter.